Summer squash on full swing! Your farmers have been busy irrigating, harvesting the season's garlic, weeding carrots, chilling doughnuts (yes, cold doughnuts go a long way on a Holiday) and finding the best secret swimming holes in town. We are playing catch up on the farm this week as we have been running hard all June harvesting and moving food. The July "lull" as we like to call it is upon us and we needed the harvesting break to catch up on some essentials. The lull is the pause between spring and summer crops and this year is a little accentuated because of the strange weather roller coaster that we have had. Things that are usually ready in July were ready in June! Not to worry though, we should be back on track with the summer's bounty next week. Cucumbers are starting to produce in earnest and there is nothing like a cool one with a little bit of salt to make you feel like summer is here. 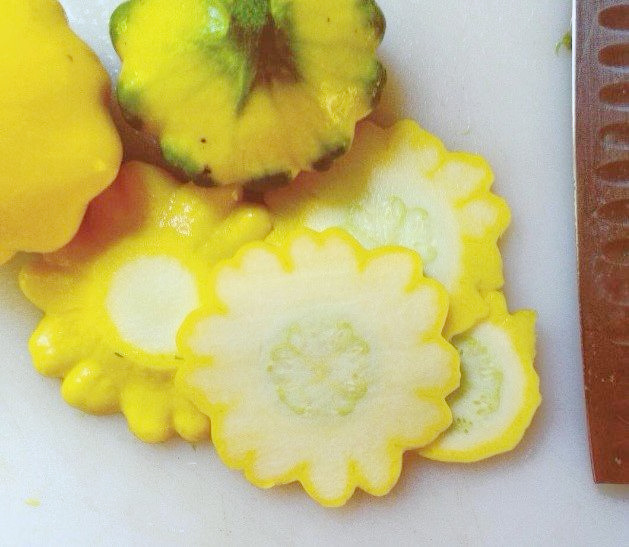 They are a very refreshing vegetable that has a lot of versatility. I love to make cucumber yogurt sauce with some fresh dill and slather it over some veggie gyros or zucchini latkes. They make great salads with rice wine vinegar, sugar and some garlic or spring onions. They are even great to just cut up and put in a cold jug of water, maybe with some mint...not bad on a 95 degree day. Good news for all you aubergine lovers out there. We put them in a high tunnel this year and they have gone nuts with the heat. This is certainly the earliest we have ever had them and it makes me think they will have a long, luxurious season. We have both the Asian variety and the Italian variety this week so you can try them both. I love to just slice them and salt them and put them on the grill. We got some rye bread at the market this weekend and I think there will be some eggplant paninis in my future. Usually I reserve my fennel and eggplant pizza combination for September, but since we have both now, I can't see why I should wait. Last week for spinach until the fall. Hoping to get another week out of it, but it really hates the heat. More broccoli coming soon as well as carrots and beans and possibly some new potatoes. Lots to look forward to!